Early morning transfer to domestic airport for you early morning connecting flight to Ladakh. This spectacular mountain flight takes about 70 minutes to Leh. Arrive and transfer to Ladakhi style hotel. Today is for rest and acclimatization and evening visit the Tibetan Bazar. Explore the Indus valley & the great monasteries. Landmarks of history & Landscape of ladakhs. O/N hotel leh. In the morning , Excursion to Stok and Matho located on the other side of Indus . back to leh and we could see near the city of the small monastery Sankar (Gelugpa) where you can walk through the countryside. Stop at the Shanti Stupa, inaugurated in 1985 by HH The Dalai Lama, And Built by a Japanese order a peace activist in the World. O/N HotelOvernight Leh. After early breakfast leave for Kargil, en-route visiting Magnetic Point and the 11th century Alchi Choskor, the oldest surviving monastic complex of the region and famous for its paintings and architecture. Thereafter, drive on to Lamayuru, and stop here for lunch and sightseeing of the dramatic located Lamayuru Monastery. Later, drive to Kargil, Stopping at Mulbik (40 kms. Shot of Kargil) to admire the 9-Mtrs. tall rock sculpture of the Maitreya Buddha standing on the roadside. Post breakfast, In the morning drive towards Rangdum. Rangdum Village is an elliptical expanded plateau that is situated midway between Kargil and Padum. 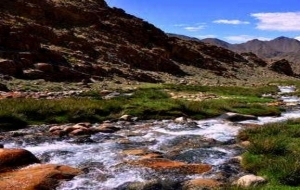 Located 130 km south-east of Kargil, in the beautiful Suru Valley in Leh District, Rangdum is surrounded by steep hills, pastures, streams and rocky mountains. Being the farthest region of the Suru Valley at an altitude of 3657 meters, it has evolved with a wild beauty. This isolated place is known for an old monastery, which is one of the most revered Buddhist places in Leh-Ladakh. After breakfast drive towards Karsha. The Karsha Monastery of Ladakh is situated in the Karsha village of the Zanskar region (9 km long link road, across an iron bridge over the Stod river). Built picturesquely along the steeply rising mountainside above Karsha village, the monastery can be seen from far. Day 06	Trek to Pisshu (3500m) 4-5 hrs. A longer walk today through harsh terrain. The trail begins by skirting terraces of barley and continues to the edge of the plain of Padum. After crossing the pastures of Rinam (3550m), we continue to Pishu, a poverty stricken settlement. Todays walk to the base of the climb towards the Parfi La, the first high pass on the walk. The trail climbs and descends frequently until reaching a sandy terrace leading upto the houses of Pidmo (3300m). We continue further along the river to Hanumil at the mouth of a fine rocky gorge. A long and exhausting stage of the trek, leading to the edge of the impassable gorges of the Zanskar river. To avoid them, we climb the Parfi La (3950m) and the Snertse La (3800m) successively. Another long day on the trail. The trail climbs through an increasingly charming setting, crossing back and forth over mountain streams a number of times. We climb over the Hanuma La (4877m) which provides great views of Lingshed. We descend again and climb upto the summit of Chapskang (4100m) before descending to the campsite. Day 10	Trek to base of Sengge La (4500m) 5-6 hrs. The trail runs up a rise to reach Lingshed monastery at the base of a colorful rocky precipice. We climb over Nekutsi La (4250m) and descend to the houses of Chumpado Gongma (3900m). Another steep climb takes us over the Kuba La (4400m) from where the trail continues along a slope. This is a very long stage over the highest pass on the trek but is of great interest because of the views. Continue uphill to the Sengge La (Col of the Lion) at 5060m. The trail then descends a slope to a chorten from where it climbs briefly to Bumitse la (4450m). A steep descent leads us to the plains of Photoksar. Day 12	Trek to Hanupata (4100m) 5 hrs. We leave the valley bottom and venture into a solitary valley climbing across a steep slope that leads to Sisir La (4900m). Descend beyond it along a new trail crossing a bridge over the waters of Spandang Tokpo. Continue along a slope to reach camp at Hanupata. Continue in the valley as it becomes increasingly narrow, giving way to a daunting gorge three kilometers in length. At the end of the gorge lies Phanjila. The last day of the walk reaches one of the most interesting monasteries in Ladakh at Wanla having some magnificent frescos. Climb upto the houses of Shila and continue along a steep valley that leads to Prinkiti La (3850m). A descent leads to a mountain stream, from where it is a short climb to Lamayuru. Visit monastery and overnight Camp.